Contact Lenses Today is a free weekly newsletter for eye care professionals who prescribe contact lenses. 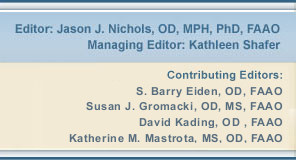 The newsletter is brought to you by Contact Lens Spectrum and edited by Jason J. Nichols, OD, MPH, PhD, FAAO. In Contact Lenses Today you will find a concise summary of breaking news about contact lens related issues and announcements from industry, plus feature articles by noted contributing editors on contact lens materials and designs, care solutions, ocular surface disease, the latest research and even international viewpoints. You can also review abstracts summarizing key contact lens articles, fitting tips from colleagues and insightful editorial comment, all designed to keep you informed about issues affecting your contact lens patients and your practice. Submit news for Contact Lenses Today to cltoday@pentavisionmedia.com. For the latest articles on contact lenses, important clinical information and helpful tools related to the contact lens practice, please visit the Contact Lens Spectrum website at www.clspectrum.com. To receive Contact Lenses Today and Contact Lenses Today Fitting Tip of the Month for free visit our sign-up page. You may also cancel your subscription here. Meet Dr. Jason J. Nichols, Editor of Contact Lenses Today and Contact Lens Spectrum, and our Contributing Editors. Missed an issue? Check here. Consumer Guide to Contact Lenses.